Remember when you could whip thousands of screaming fans into a frenzy from the comfort of your living room? Rock Band 4 is coming to PS4 and Xbox One in October and I got to try it out. What could be more quintessential to the up-and-coming band experience than belting out Aerosmith’s Walk This Way to a dingy room of bored-looking games journalists who would rather be doing something else? At its heart, this is the same Rock Band you remember from the last console generation. Hell, you’ll even be playing the same songs, since you can import your entire DLC library from the previous generation. You’re limited to the same platform holder though – Xbox 360 songs to Xbox One and PS3 to PS4. There’s no transferring song licences from Sony platforms to Microsoft, or vice-versa. 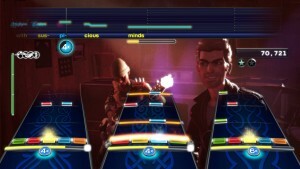 You can’t import The Beatles: Rock Band either, much as you couldn’t bring it to RB3. There will be an all-new batch of instruments coming from co-publishers Mad Catz. If you have your old instruments, they should all be compatible with the new versions, natively on the PS4 or with an adapter on the Xbox One. This is still under development, so no details yet. Sadly, the new instruments didn’t make it to the preview I attended, so I played on a Beatles drum kit and last-gen instruments. There are improvements to streamline the experience of playing together – you can vote on the next song or doing an encore. “Rock Band, historically, has been about playing a song and then going back to your song library and arguing with your friends about what you want to play next,” said Sussman. “While kinda fun, we felt like we could put a time limit on that. Spend more time playing and less time arguing. In between songs, players can hold down a colour on their controller and choose from a multiple choice selection. It can be a specific song, it can be play a Seventies song, play a song with extra drums, any one of five or six categories.” You can jump straight back to the song list if you want to pick something specific. These are all good and interesting improvements, yet feel more like a small iteration than an all-new experience. 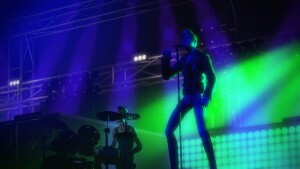 Do you feel like you need a new Rock Band on the current generation of consoles? Rock Band 4 is out on 6th October for PS4 and Xbox One.